This is Bunkyo Hanami festival (文京さくら祭り, bunkyosakuramatsuri). If you want to do hanami in street style, this is the place. Harimazaka, or Harimazaka Sakura Namiki, is a street in Bunkyo ward. many sakura trees are planted in the Center and both sides of this street. In the season of hanami, people come together packed lunch with mat and packed lunch packed lunch, make party and enjoy flower. The sakura trees are well visible from the car in the street. In the season, you can also enjoy drive-through hanami. 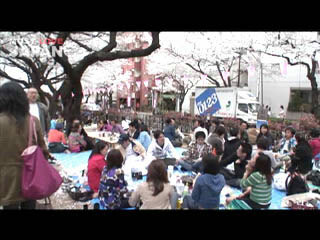 Harimazaka is one of the great Hanami spots in Tokyo. There is a park in between slow slope street, and about 130 sakura are planted in this park. It has an Yellow Sakura which is very unique kind for sakura flower. In the spring they have Sakura Festival.